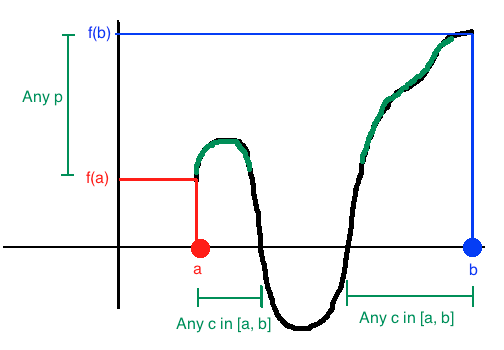 Theorem 1 (The Intermediate Value Theorem): Suppose that $f$ is a continuous function on the closed interval $[a, b]$ where $a < b$. Then for all $p$ such that $f(a) < p < f(b)$ or $f(b) < p < f(a)$, there exists a $c \in [a, b]$ such that $f(c) = p$. The intermediate value theorem can be used in order to determine if there are roots to a given function on an interval $[a, b]$. If $f(a) < 0 < f(b)$, or $f(b) < 0 < f(a)$, then there must be a point in which the function crosses the $x$-axis on the interval $[a, b]$ given that the function is continuous since on that interval there are values of $f$ that are negative, and there are values of $f$ that are positive. Show that there exists a root of the function $x^3 - 3x + 1 = 0$ on the interval $[0, 1]$. Now since $f(0) > 0$, and $f(1) < -1$, and since $x^3 - 3x + 1 = 0$ is continuous for all real numbers $x$ because it is a polynomial, then there must be a point where the function $f$ crosses the $x$-axis. Hence, there exists at least one root to the function. Note: The intermediate value theorem does not tell you how many times the function crosses the $x$-axis, as there is a possibility that $x^3 - 3x + 1 = 0$ could have crossed the $x$-axis at most $3$ times (since the degree or highest exponent in this polynomial is $3$).